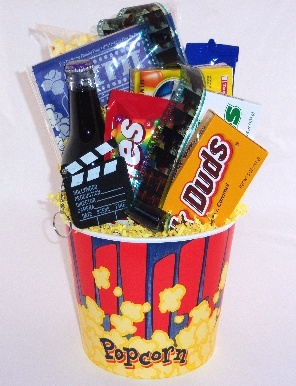 This popocorn filled movie tub is stuffed with 3 big boxes of movie candy, a bag of butter popcorn,1 bottle of soda, (of your choice) a bag of peanuts and a package of microwave popcorn. Perfect for the teenage birthday! ** Add a Movie DVD for additonal fee!